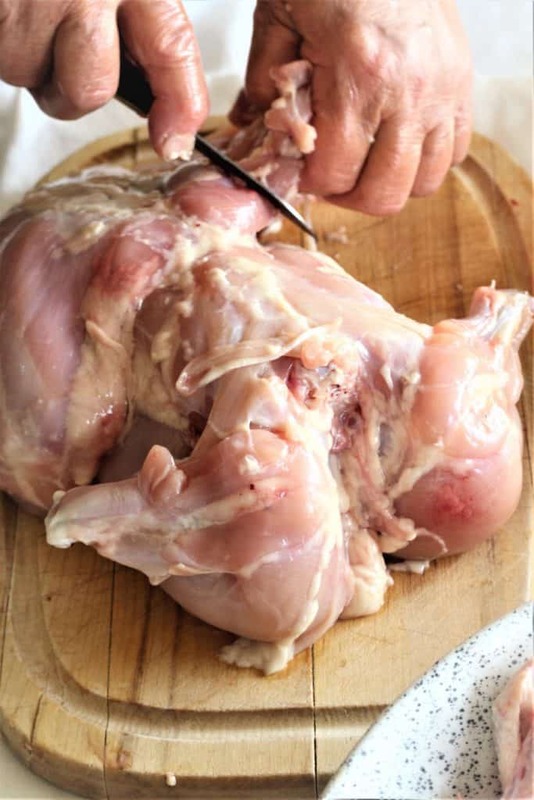 Italian Style Stuffed Chicken or “Iaddina China” as we call it in Sicilian is without a doubt quite an undertaking but well worth the effort when you bite into this flavourful, moist chicken! Throughout this journey of documenting my mother’s recipes, I am frequently fascinated to hear about how the recipes have evolved over the years. There was also the great surprise in finding out that my mother’s arancini recipe never originated from Sicily! I’ve learned that they evolved depending on the availability of ingredients, cooking tools, and means available for cooking. My mother actually never saw “iaddina china” (which means stuffed hen in Sicilian) being made when she was a child. She simply interpreted it in her unique way. Adjustments were made throughout the years in order to please her palate and make it easier to cook. After watching her make it from start to finish, I’m ever more in awe of her culinary abilities which she often downplays. The amount of time, skill and patience put into this dish is not something I am sure I am capable of. In fact, as she was preparing chicken I was thinking of possible shortcuts! But then again, it just wouldn’t be the same. Let me explain how it was prepared in Sicily. 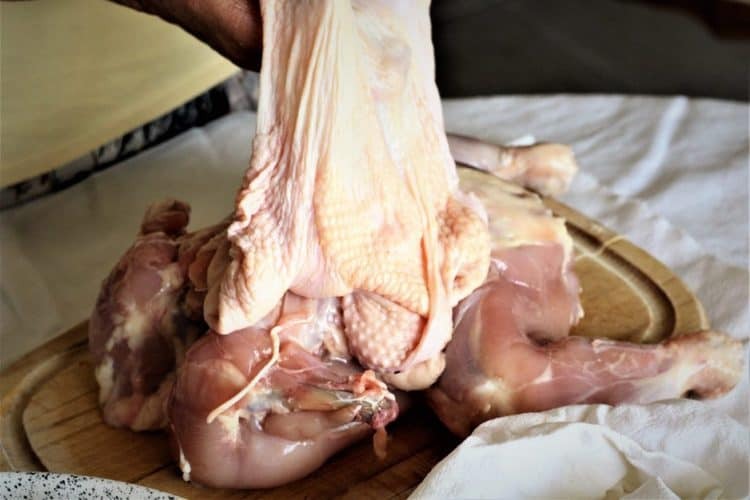 The hen, once killed, was sent to the home of a nearby relative who was known for her great skill in deboning a chicken. Next, a meatless meatball mixture was prepared consisting of the usual bread, eggs and cheese mixture. Ground meat was simply not available at the time. The hen was deboned and then stuffed without removing and chopping the flesh as my mother now does. The filling was simply stuffed into the cavity. The hen was then wrapped in a kitchen towel in order to keep it from opening up and falling apart, and then boiled until done. When I compare it to my mother’s crispy skinned chicken surrounded by carrots and potatoes I was unimpressed by this towel wrapped boiled dish. But since meals with meat were hard to come by in those days, this boiled hen was quite appreciated. Refrigeration was not available so any leftovers were eaten for breakfast the next day. I was thinking about that last week as I sliced up leftovers to make a sandwich for my son’s lunch. Here in Canada, my mother cleverly adapted the recipe by separating the skin from the flesh in one piece. She then removes the flesh from the bones and chops it into pieces and added to the stuffing. She does this swiftly and effortlessly! I managed to capture a few shots of her capable hands doing so in several step by step photos below. I hope this will be helpful in helping you to visualize the steps in preparing this recipe. 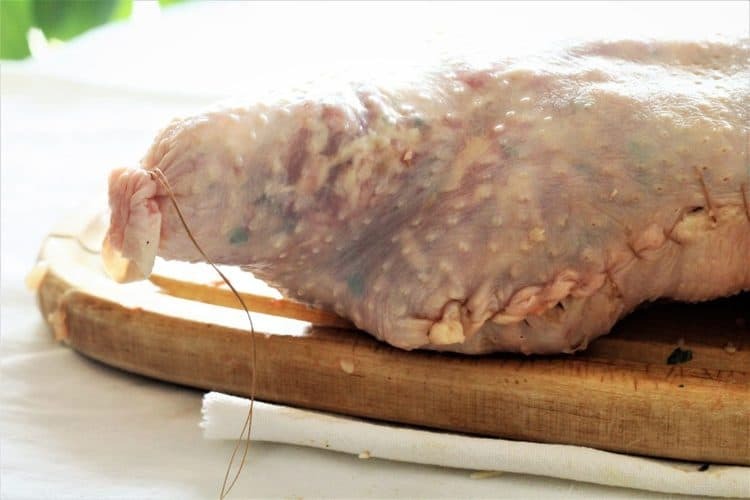 If you try out this recipe, don’t forget to save the carcass and wings to make a broth. 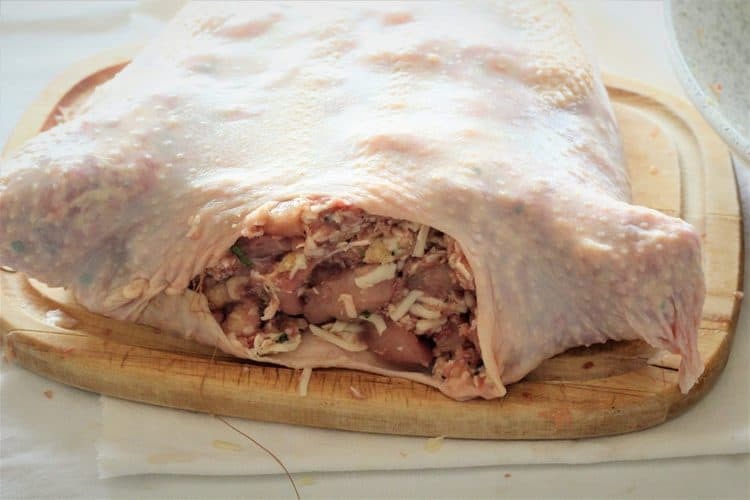 The skin is stuffed with the filling and sewn shut for baking. 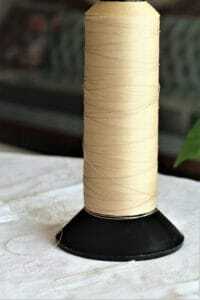 This is the same spool of thread given to her about 50 years ago which she keeps uniquely for this recipe! Slide your fingers between the breast and the skin and begin loosening the skin. The skin is detached from the legs. 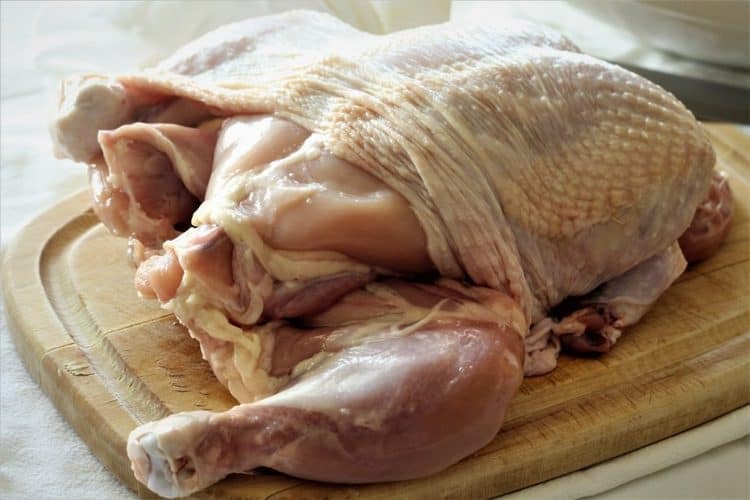 The skin is removed from the flesh in 1 piece. The flesh is cut away from the leg bones. The breasts are detached from the rib cage. The flesh is chopped into bite sized pieces. Holes in the skin are sewn. The skin is sewn shut and ends where the legs were located are tied with string. 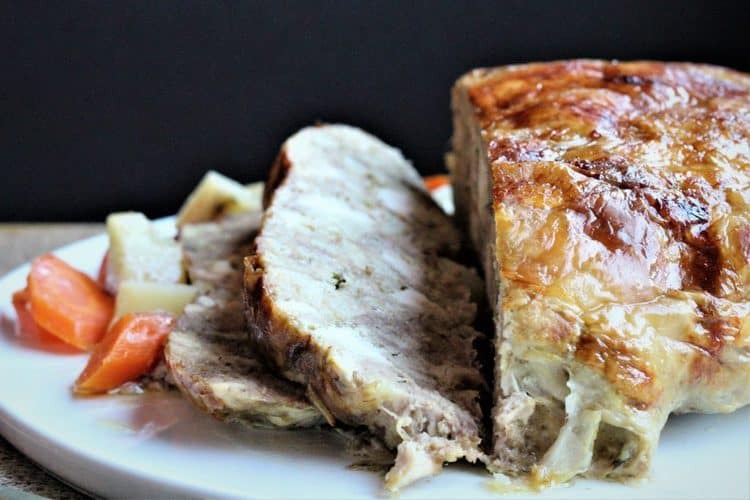 The chicken is placed on a bed of chopped carrots and potatoes and it roasts for 3 hours resulting in this golden colored, crispy skinned, incredibly flavourful dish. I know this whole procedure is lengthy and intimidating, but definitely worthwhile taking the time to make it. More reason for me to finally preserve this recipe here. 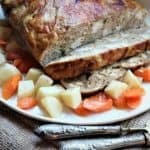 Thanksgiving is around the corner and I know some of you are not fond of roast turkey, so here is an alternative that will be sure to impress. If you give this recipe a try, please tag me with your photos with @mangiabedda or #mangiabedda on Instagram or Facebook! Enjoy! 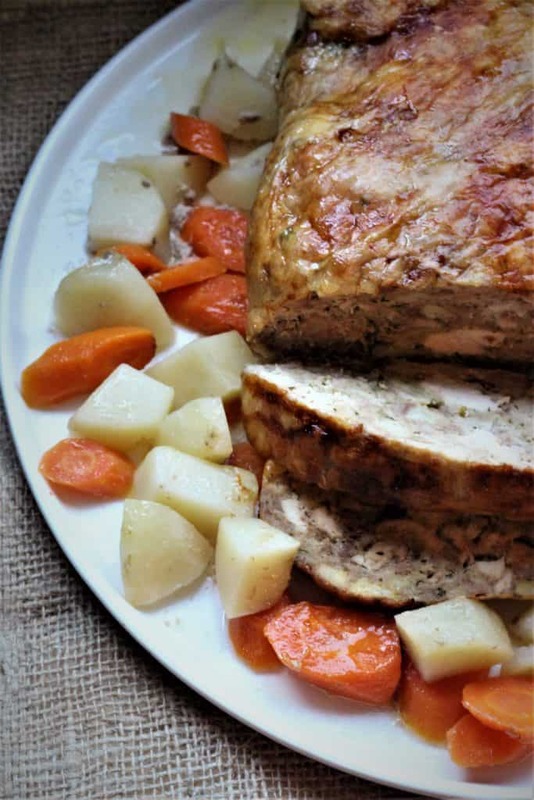 This Italian stuffed chicken is a classic from my childhood! Leftovers make perfect sandwiches for lunches. 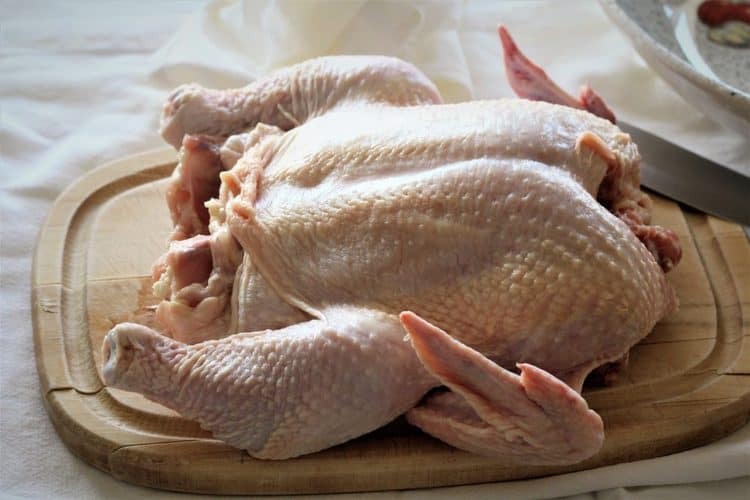 Place chicken on a clean surface, breast side up. Begin by cutting off the wings and set aside. Slide your fingers between the skin and flesh of the breast and begin to loosen the skin from the flesh. Move toward the legs and loosen the skin. Pull away the skin from the bone until it detaches. This will leave 2 holes where the legs were located which will later be tied with string in order to prevent the stuffing from coming out. 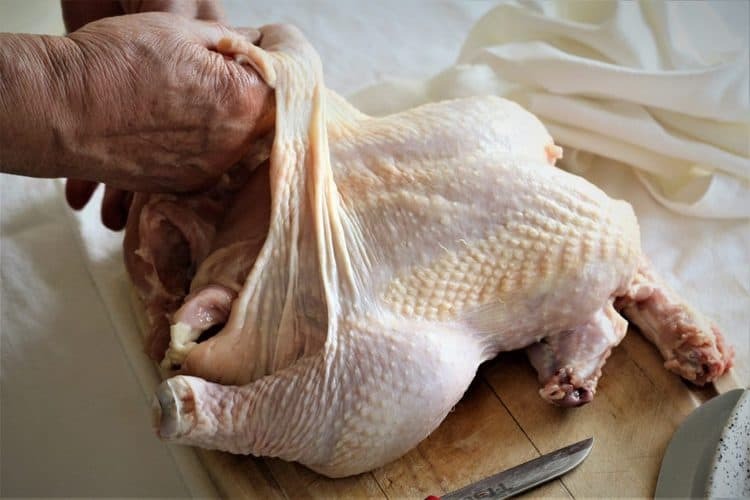 Turn the chicken over and in the same manner loosen the skin from the back side. At this point you should be able to detach the entire skin from the flesh in 1 piece without too many holes in it. Set the skin aside. 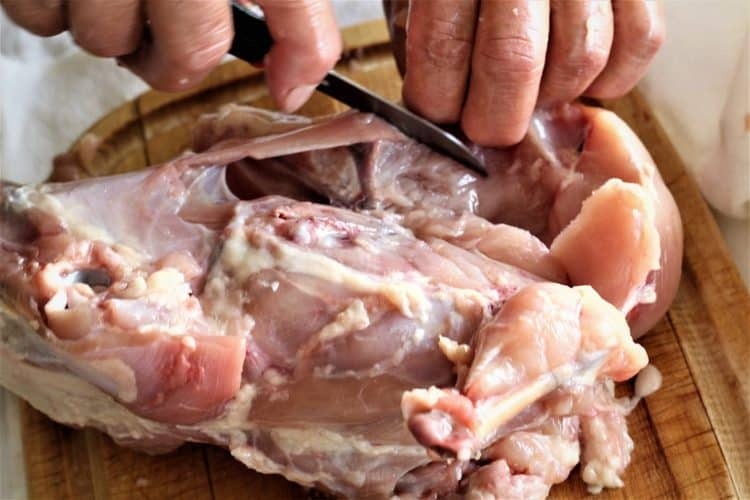 Using a pairing knife cut away the flesh from each leg. Remove the bones and set aside. Detach each breast from the rib cage. Cut away any other large pieces of flesh from the bones. It is not necessary to remove each tiny piece of flesh as you'll have enough for the filling. The remaining carcas and wings set aside earlier will make an excellent broth. 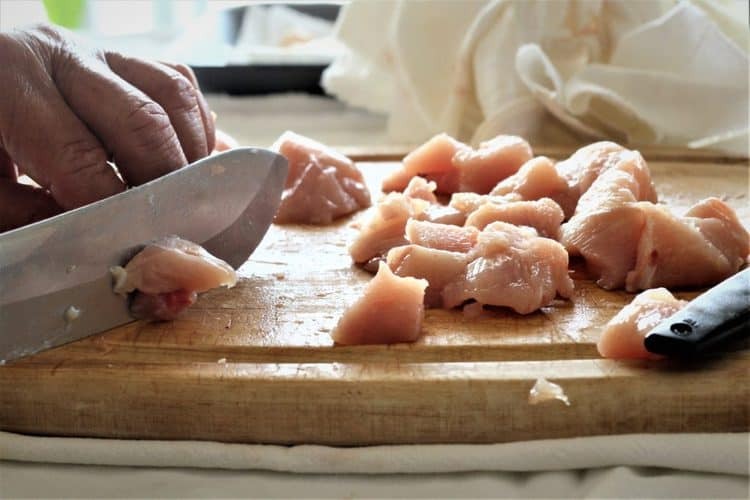 Chop the chicken flesh into bite size pieces and place in a large bowl. 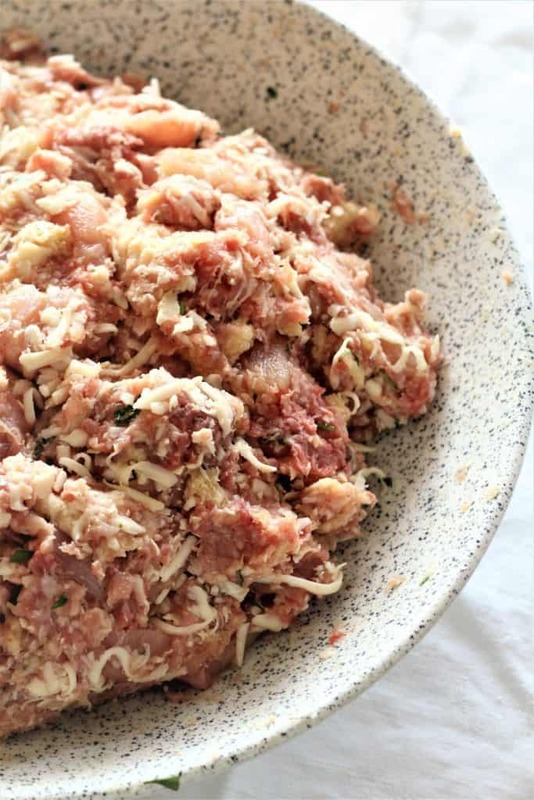 Add the bread crumbs, parmigiano and romano cheeses, parsley, eggs, ground meat, salt and pepper to the bowl. Using your hands mix the ingredients until well combined. Stir in the mozzarella and mix once again. You are now ready to stuff the chicken. Using a clean needle and thread, begin by sewing shut the holes where the wings were located and any other holes except for where the opening of the cavity was located. This is where you will stuff the chicken from. Tie string around the openings where the legs were located. Next, stuff the chicken making sure to evenly distribute the filling throughout the entire skin. Once filled, proceed to sew shut the remaining gap. Preheat oven to 400F. Add diced carrots and potatoes to the bottom of your baking dish. Drizzle with olive oil and add salt and pepper. Place the chicken on the bed of vegetables. Pour 1/2 cup wine over the chicken and 1/2 cup of water directly over the vegetables. Drizzle olive oil on the chicken and coat the surface evenly. Cover with foil and place in the preheated oven for 30 minutes. After 30 minutes lower the temperature to 350F. After 30 more minutes have passed, remove the foil. The chicken will roast for a total of about 3 hours. When done the internal temperature will be 180F and the skin will be crisp and golden. Serve accompanied by the carrots and potatoes. Hi Nadia, I really enjoy your recipes and this one is one I really want to try. I too am Sicilian and my mom is a fantastic cook. Many of her recipes are in bits of paper that no longer have the ability to stay in the little books that hold them. Not to mention the many copies of the variations on each recipe! My mom no longer cooks, but my sister and I stay true to her recipes and like you, always look for an easier solution to making some of the recipes that have been made a certain way for 100 years. Sometimes we succeed, sometimes the original is the best way. I love that you recreate and follow the traditional style of Sicilian cooking. I just made 'mostata' for the first time....what a lot of work, but so worth it in the end. The making of this wonderful pudding made from wine grape juice that can be eaten warm, or dried to a liquorice or wine gum like consistency can be added in 'cudureddi' or eaten as a delicacy. Wishing you great success in your career and keep sharing! Maggia bedda e buon appetito! Thank you for your valuable feedback Margaret! My mother also has a tiny black book full of recipes that I can't read, so that is partially why I have undertaken this quest to document them. My aunt used to make the "mostata' but she called it something different. I'll have to ask my mother about that. But you're right, it's all worth taking the time to recreate these dishes. Grazie! 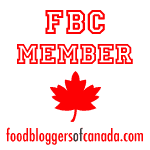 I love learning the history behind different foods and recipes! Your mom's stuffed chicken sounds like a true labor of love and looks DELICIOUS! Great job capturing your mom on the step by step...Masterchef ???????? has nothing on your mom???? I totally agree Marisa, it's fascinating learning about the origins of different foods. As for Masterchef, perhaps they should have (or perhaps they've already had) a nonna competition! Thanks for stopping by! One of my aunts used to make this. It was one of her signature dishes and she used to bring it to our yearly reunion. It was delicious! 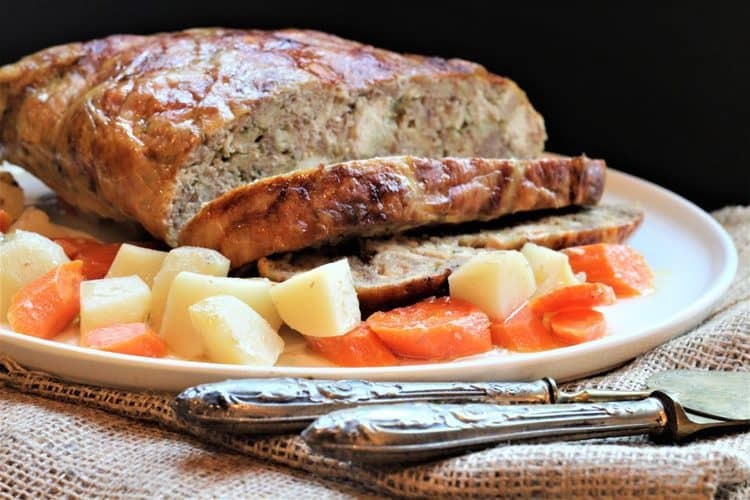 Thanks for sharing this recipe and the photo. Wow Liliana, you’re the first person to tell me that you’ve heard of this dish! Thanks for sharing this with me!